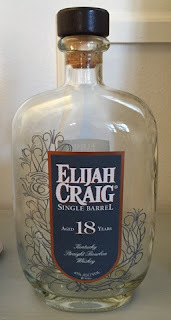 The 18 year old version of Elijah Craig seemed to be more readily available this year than it (as well as other aged Elijah Craig expressions) has in the past. This could be due in large part, though, to the heftier price tag than it has seen in the past, clocking in at around $125. But, now that it's a few months after its release, I no longer see it on the shelves or inside the locked cabinets at all my favorite liquor stores. Perhaps this is an indication that the bourbon boom is not seeing an end any time, and well-aged bourbons still command such prices. That being said, this bottle was nonetheless well worth the experience. The nose is absolutely incredible--a wonderful blend of caramel and vanilla, pipe tobacco and apple. It was almost an earthier apple pie scent that I could bottle up and wear as a cologne (if I wore cologne). While I couldn't stop sniffing this one, eventually I got around to putting the bourbon to my lips, and in the words of Frank the Tank, "It's so good once it hits your lips! It's so good . . ." In older bourbons such as this, the typical bourbon flavor profile is often overwhelmed by the oak and tanins, making for a drier bourbon with a sort of bite to it (and not the spicy kind of bite). Here, although the wood tones were there, they were far from overwhelming, but rather complementary to the traditional vanilla and caramel flavors. The tanins that I expected to run into were simply nonexistent. The sweet flavors typical of bourbons were there, but the balance of the oak made it a somewhat more savory bourbon, with the sweet caramel and brown sugar notes being a bit more subtle. This also comes across as a lighter bourbon, both in flavor and texture. The flavor was lightened up by somewhat unique pear and floral flavors, flavors which I frequently find in single malts but rarely in bourbons. The texture was light as well, coming across as almost delicate, light on the tongue, but yet I wouldn't describe it as watery. It still coated the mouth and throat in a deliciousness that never seemed to go away, but without the oily residue texture that you frequently get from bourbons that linger on forever like this one. I can't say enough good things about the Elijah Craig 18 Year. It's 90 proof, and when I run into lower proof bourbons where I really love their flavor, I tend to wish that it was bottled closer to cask strength to add flavor and complexity. This bourbon, however, comes across just perfect at 90 proof, and I think that if it were bottled at cask strength it might actually detract from my enjoyment.